Well, I’m just a little bit surprised that I’m actually posting about this, but here I go anyway. :) If you’re interested in learning more about my feelings on the subject of guns and other weapons, I’d love for you to listen to a podcast I recorded on that subject a few months ago to understand my perspective just a little bit more. You are aware, right, that I live in a household of males? I am surrounded by toy light sabers, swords, knives, guns, and many other varieties of weaponry. Recently, our boys have been introduced to an awesome new toy – the Air Soft Gun. Oh yes, they are now old enough to play air soft. Using their own money, they each got themselves a small air soft pistol. Much to my surprise, Matt had so much fun playing with them, he got his own pistol too. Then, a friend of our family, who happens to be a gal who loves guns, joined the fun. And long story longer, that very fun girlfriend talked me into playing air soft too. I tried to argue. I gave plenty of excuses. But she talked me into it anyway. Once the boys heard her trying to talk me into it, they joined the begging. What’s a girl to do? I figure if I can’t beat ’em, I better get out there and join ’em. Or something like that. Matt got a picture of me trying to figure the whole thing out. Well, terrible as I was at playing, I can’t believe how much fun I had. It was crazy fun. Exhilarating. I loved it. Unbelieveable. Then I came back into the house, put down my gun, washed my hands, and continued to make dinner to feed all of us. It appears that I can go outside and shoot an air soft gun with my family and friends, then come back in and still be a homemaker. How about that? It didn’t kill me at all to take a break and have fun like that. And I might just play again sometime. I am going to have to try that! Looks like fun, my kids are too young but I am sure the hubby would get a kick out of it. My young sons both got air soft guns as well. I am extremely uncomfortable about the whole thing. Granted my boys are young, but still, can’t you get hurt by one of those? Are you actually shooting the AT each other? That goes against everything I ever thought about guns! Really, doesn’t it hurt? I only ask because, my boys don’t realize that people actually shoot at each other, so I know they won’t do it on purpose (at least not for awhile), but if they get accidentally shot, won’t it hurt? My boys would faint from wonderfulness if I gave them permission to really shoot — especially at me! I have a lot to learn about this past time! I’m going to keep you in mind as a resource! THANKS! My three boys aren’t into it, but my nephew got one for Christmas. Looks like you all will have fun! How fun!! I find that it’s usually the things I know I’m not very good at…so I don’t feel pressured to perform at…that I enjoy the most! I seem to be WAYYYYY out of the loop, but what’s an air soft gun?? Love the airsoft! We have five boys and three girls, and they all love the airsoft.guns. They have such fun out in the yard and I love watching. One of these days I guess I’ll just have to join in. They are not allowed to play violently, as in no violent speech, threats, point blank head range kind of nonsense, but they love to strategize and plot their teams and such. Just fun play, but good practice for good sportsmanship and good soldiership!! There is a time for peace, and a time for war, and should God ever place one of my beloved sons in a military position, I sure want him to know good sportsmanship, and how to handle all that power in the use for right. Thanks for hosting! I am sharing a post on what we really need for whole health in the New Year as well as my Top 10 Recipes from 2011. I do have a question about the Air Soft Guns – funny – my youngest received one from his grandpa as a gift and we were surprised about 2 things. 1. The age recommendation. In the catalog it said 6+ but the box of the gun said 14+ – do you think they are OK for a 6 1/2 year old? he’s pretty coordinated. 2. The size of the ammunition. The catalog and website showed the ammo to be pretty big, but it’s really really small – I am concerned about them getting lost all the time and having to spend a small fortune on purchasing extra ammo. Finally, we did read some reviews on the guns (after the fact, sadly) that they didn’t all hold up that well. Maybe you could share where you got yours and what brand / style if you’ve been happy with them. Thanks! So we were planning on returning the gift, but if you have some tips or a better experience I’d be thrilled to know! What a helpful response! Did you get the pack of “10,000” at Walmart too? Thisis really going to help w/ our “gun search” problem! Thanks, Laura! Oh – do the pellets harm lawn mowers? Taht wouldn’t be good :-). Sorry if there are typos. The reply screen isn’t showing up entirely so I can’t see what I’ve written :-). My son got a bb gun for his birthday this year and I find myself wanting to shoot it as much as he does! :) it’s a blast to try and shoot old cans off the fence post. I have fabulous memories of shooting a bb gun with my Grandfather! sounds and show are spectacular – so, no it’s not just for boys. I love this! My son got a new Air Soft pistol and some targets for Christmas. He plays with some friends on their property. Considering he has only sisters, its great for him to get out and active with the guys. I didn’t have a sister til I was 14, and I loved shooting with my brothers!! Now that I have a hubby and kids (boys and girls), we have a great time shooting together!! Even if it’s just Nerf!! My 4 boys all have air soft guns also. I can definitely relate to the pellets in the dryer! LOL!!! Have fun! My boys would love to play with those! This is my first time linking up ~ nice to meet you! My boys have been begging to graduate from nerf guns to air soft guns, even offering to buy them with their own money. I have been hesitant to get them, partly because we live in a bigger town (by Nebraska standards!) and I am not sure what the laws are for them. However, we are blessed to be moving at the end of the month to a small rural town, and I know that the boys would love some for their upcoming spring birthdays. I will have to think about it. And I would definitely join in! I used to be able to out shoot my brother on our BB guns! I have 3 girls, and they LOVE airsoft! It is something that they can do with their Papa and they all have a blast. We get together with other homeschoolers in the area and make teams. ALL of the dads play. Airsoft Atlanta is one of their favorite websites. They go way beyond those little pistols! You have to wear safety masks and yes, it hurts. But then, what’s a little pain to fun like this? My kids got air soft guns 2 christmas’s ago. I also was not thrilled about it. We do hunt here and we eat wild as much as possible. So whenever they are practising shooting. They head to our mini range. I head for the house. I just cannot be there and well its not safe having a mother who is completely out of her witts worried. Well, these air soft’s came into our lives. They also got the black bb’s as they stick to the skin better. They got them as I felt they were better to have than a real gun. At the time we were having coyote and bear issues. These would do nothing for bears. But I think they helped with coyotes at first. Long story short we had so much fun with them. Mom especially loved it. That we had targets set up in the living room(6ft of snow outside) and we had a blast firing them off. Now I must confess 2 years later there is still bb’s throughout the house. =0) Its also very addicting. Welcome to the club. “toy guns” for practical use like target practice and “pest” control! “rough and tumble,” fighting, wrestling, being boys, etc. I’m in the same situation….two boys and my husband (who acts like a little boy sometimes!!!). They enjoy to see their mom doing “boy” things. Thank you for reminding me that it’s OK for them to be rough…they are boys I have to understand them. I’ll play wii with them today. My son and husband get together with other sons and dads and have a BLAST with their airsoft guns. They play in a big field. We women generally sit inside eat, talk and talk and talk and are actually ready to go home by the time they are done! I think this is the only time I EVER wait for my husband to be done…he’s always ready to go before me. The men I think may enjoy it more than the younger boys (some they try not to shoot) but for teenage boys…I love that they can do something together that is so much fun! What fun! We gave our daughter a pink bb gun for Christmas and our son a set of throwing knives… You can bet I’ll be out there with them! Thanks for hosting, Laura! We have been playing this with our kids for years. Running around 40 acres with air soft is fun. I have been sweeping air soft bee bees for years enjoy have fun!!! Right now I only have an adult boy (fiancee), but I’m sure he’d love an airsoft gun too! Boys will be boys, eh? Mine are too young for this quite yet, but I can just see my daughter right a long with her Daddy and brother wanting one too! My son and his friends love having airsoft “wars”. I was NEVER going to let my son have any type of gun, EVER, but as he got older…you know the story. I can’t believe how fun it has been for him. He, and his friends, spend hours in our woods, digging trenches, building forts for cover….GREAT creative activities. He sewed himself a vest out of camoflage material with squares of plexiglas inside, so his chest and back are fully protected. (He also wears a full face mask and bought my husband one for Christmas). His friends thought his vest was so great, they asked their moms and grandmas to show them how to sew. I NEVER imagined all the creativity that would come out of this. And, my nearly 15 year old son and his friends are having good clean fun, in my back yard, while they could be doing things that are a lot worse. 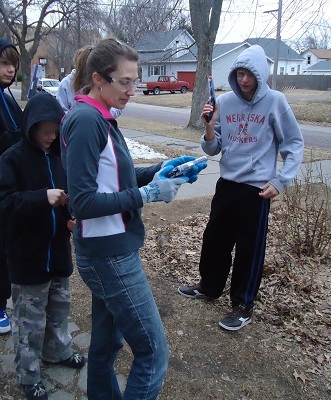 I even found myself setting smoke bombs off for the boys (for cover) one day…me, the mom who HATES guns AND fireworks! Happy Airsofting!! I have a little girl (she is 2) and next summer she will be getting her first bb gun.. I know its early, but she already goes small game hunting with daddy and knows how to shoot a 22 rifle when her daddy is holding it. I had my first bb gun at 3 so I feel its okay for her to. The guns stay locked up in our gun safe and she knows the only time she can mess with any of them, loaded or not, is if Mommy or Daddy has one. Once she turns 6 she will get her hunters certification and we can all go deer and turkey hunting! =] Thanks for this! Boys and their guns…. :). Like you said, if you can’t beat em, join em :). I specifically remember my oldest son at the age of 14 months turning a stick into a gun and a sword while we were walking around Williamsburg. I agree…tried not to have guns, but the kid literally ate his PB&J into the shape of a gun and proceded to shoot things at the table making all sorts of sound effects. HA! Seems funny now, he’s 19 and has taken all the hunter’s safety, etc and is a great shot – beating out adults twice his age. That sounds like a blast. I will have to try that with my little men. I have a 14 month old baby boy and another baby boy due in March. This Christmas my husband wanted to buy them both Nerf guns! Thank you for showing me the fun of joining in with the boys! I am chuckling at the picture of you…trying to figure it all out! Classic! I am thankful for a walk I took with my middle child today. He was having a hard time and just needed some “mommy time.” My mom is in town, so I left the other two boys with her, and my son and I strolled around the block, holding hands, occasionally racing up and down the sidewalk. We both came home refreshed, feeling just a little bit brighter. You are such a good wife and mom – I’m gonna check out that airsoft stuff! What a fun mom you are!!! my boys don’t have air soft guns yet, but i’m sure it will only be a matter of time before they do. right now, my youngest boy is 5 and isn’t as careful as we’d like him to be before aiming an airsoft gun! i think i would totally LOVE playing with one myself!! My youngest loves to go pick up all the pellets. He has a great collection of green and orange in a glass jar. My boys are a little too young, but I’m sure I’ll give it a try with them when they are! My husband went through the air soft phase a few years ago. I went with him once and it was a blast! We’ll probably do it again when our boys (five and one year old) get much older! I believe that you are writing about what we have as a BB gun. Yes? My husband was in the Army and believes that his boys should respect guns and learn about them, and they do love to have target practice with a bullseye. Thanks for opening your heart and writing about this. I bought my wife a BB gun for Christmas and made her targets with pictures of snakes. I’m going to get flamed for my comment but we have taught our children to respect guns (they are NRA and Boy Scout trained in rifle and shot gun). I would allow them to target practice with an air soft but they have been taught that unless they are serving in the military, police officer etc. that a gun is NOT to be pointed at another person even an air soft gun. As I tell my kids, different rules, different families so don’t think I’m trying to push my beliefs on anyone else! Please if you do allow your child to use an air soft gun, train them in proper safety (eye protection etc.) and remind them that it isn’t a toy and can kill an animal. One of my son’s friends was surprised when he aimed it at a bird and killed it. Also, teach them to never carry it in a public place so as not to be confused as carrying an actual gun. I know it sounds silly to confuse an air soft with an actual gun but I believe it has happened with tragic results! Be safe everyone! Thanks for sharing Michelle and Kristi. I posted a similar thought earlier, and really appreciate hearing what both of you had to say! For Christmas this year, my family broke out the laser guns and walkie talkies everyone received and ran around trees, hills and a barn. It was an unbelievable memory that my kids said was their very favorite part of Christmas! And the scariest thing, was that it was my surprise to everyone, not my husband’s. But we had a blast. God bless you for your faithfulness. I am excited to be linking up here for the first time! I am sharing my post about the goals I have set for myself in 2012.